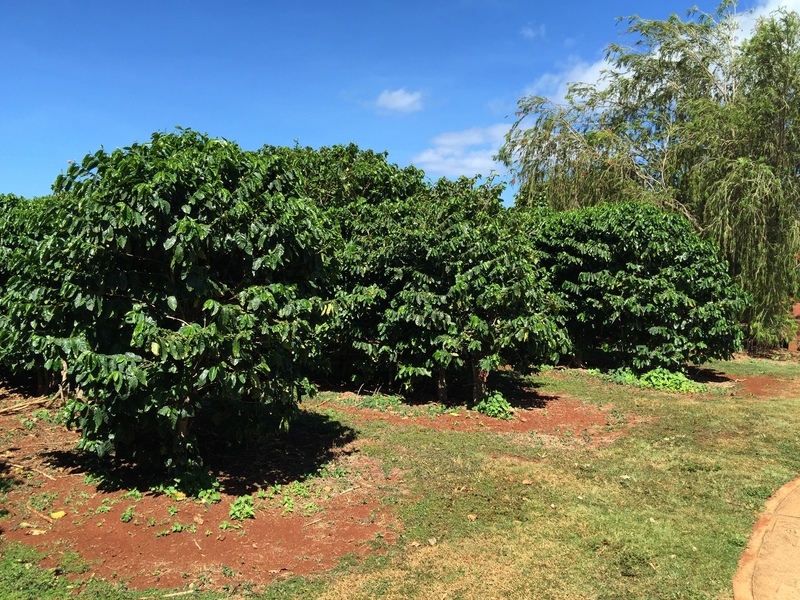 We recently visited the island of Kauai in Hawaii where they grow a significant portion of the Hawaiian coffee crop. 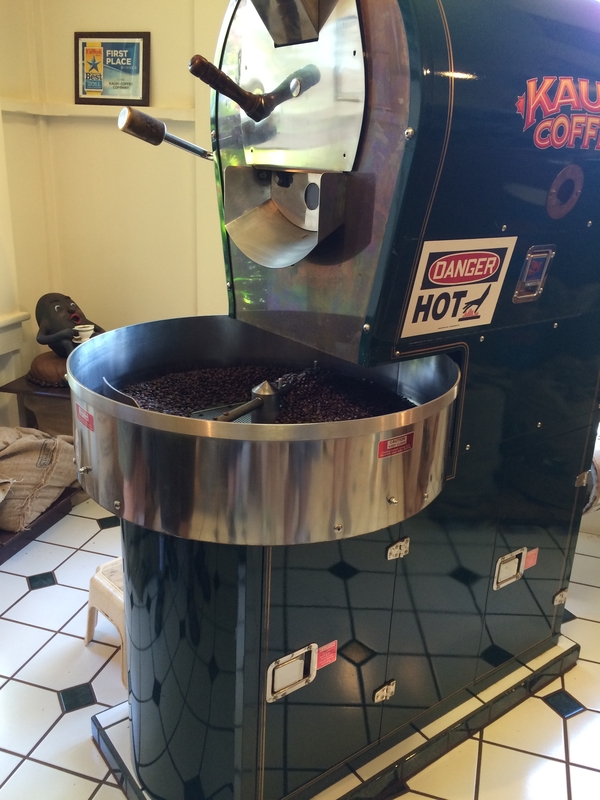 We took a tour at the Kauai Coffee Company and learned a lot about coffee. The Kauai Coffee Company is the largest producer of coffee in the United States of America. 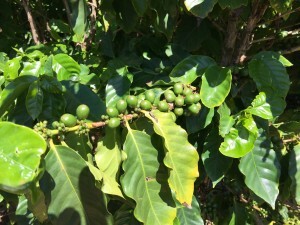 The coffee trees grow on the relatively steep slopes of the island overlooking the Pacific ocean. 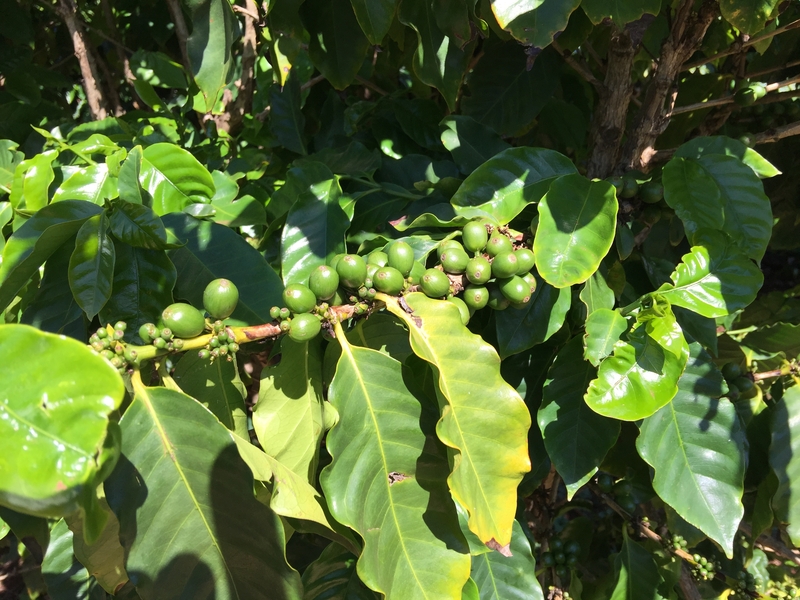 The coffee growing area is in a dry environment on the island and the trees are drip irrigated. The dry environment also reduces the number of pests and diseases that effect coffee trees. The trees blossom mainly in early spring, beginning in February or March, but continue to produce blooms into late spring and early summer. 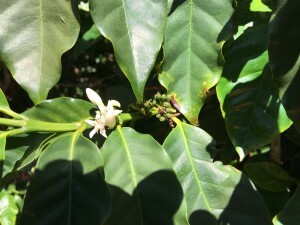 The timing of blooming also depends on the variety of coffee being grown. When you look at the developing coffee “cherries”, they are different sizes depending on when the flowers were pollinated. It is the seeds within the cherry that develop into the coffee beans. Usually there are two beans per cherry. The trees are trimmed to accommodate mechanical harvesting. The harvester used was adapted from a machine designed to harvest blueberries. The coffee flower is very fragrant and is used to produce a coffee blossom honey. This honey crop is very small due to the relatively small acreage of coffee trees and the partial year that the blossoms are available to the honeybees. When the coffee cherries begin to ripen they start to turn red. 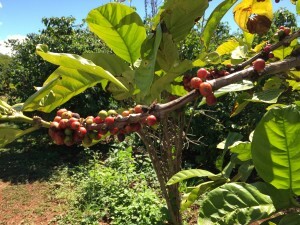 The specific variety of coffee in the photo is a somewhat ever-bearing coffee which can have blooms, young cherries and ripe cherries on the coffee tree all at the same time. The ripe coffee cherries are harvested from mid October through mid December. After the cherries are harvested they are taken immediately for “Wet” processing. During the processing the beans are separated from the pulp, dried, and prepared for storage. The coffee is ready to be roasted after the beans are harvested and dried. Once the beans are roasted, flavoring oils can be added to add virtually any flavor desired to the coffee beans. If you should happen to visit Kauai, we highly recommend visiting and taking the short tour at the Kauai Coffee Company.